Hi friends! What’s new in your world? I’m ELATED that so many of you have made the Chocolate Chunk Banana Bread. Let me know if you make substitutions and keep the pics coming! In other news, I was featured in Forbes this week chatting about food freedom and balancing multiple passions. Give it a read! All in all it’s been another super busy week for me and the restaurants so let’s dive right into the good stuff—AKA smoothies, sourdough toast and all the pasta. 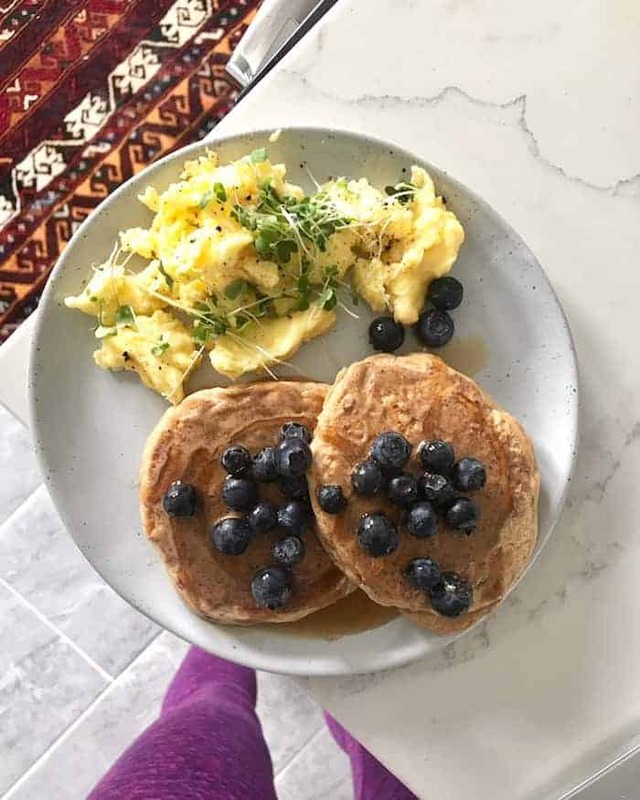 Super simple whole wheat pancakes with blueberries, almond butter, and maple syrup plus scrambled eggs and micro greens. 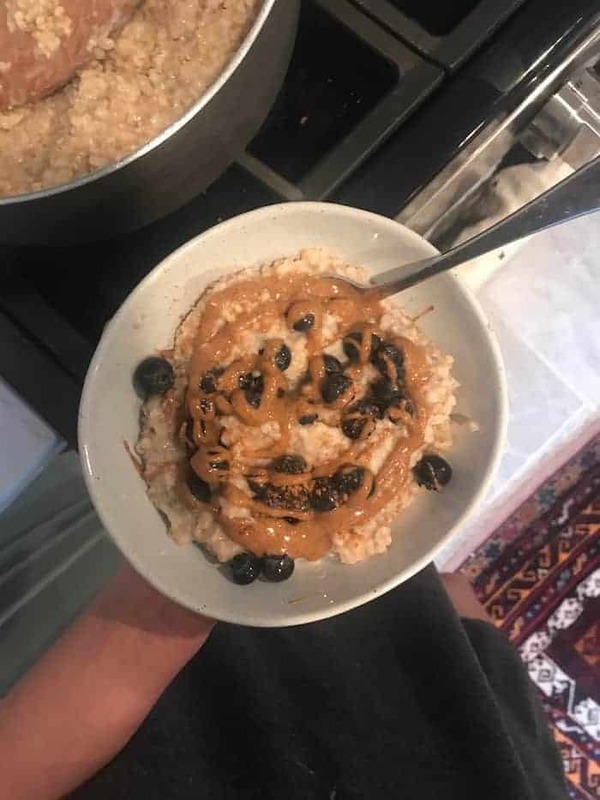 Steel-cut oatmeal with blueberries, cinnamon, and almond butter. The Pink Cookie Bowl as a smoothie! 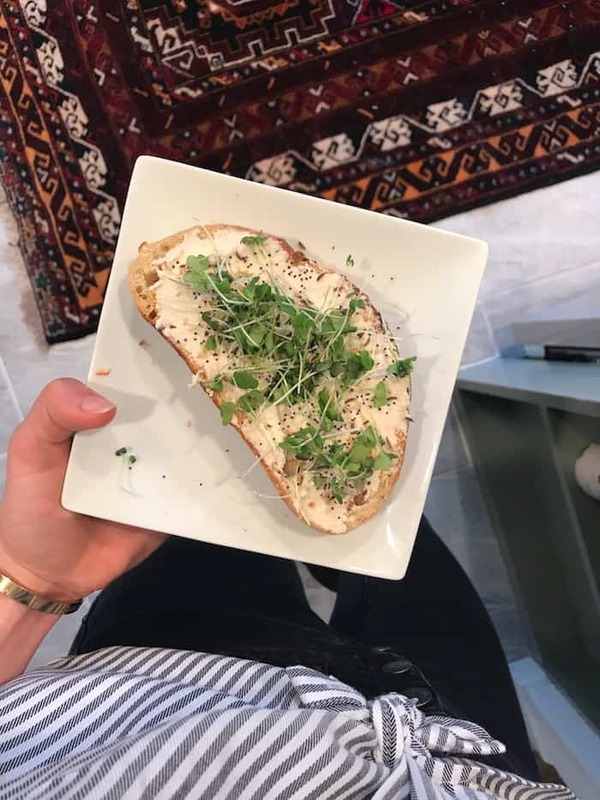 Local sourdough toast with homemade cashew cream cheese (method in this post), everything bagel seasoning, and micro greens plus half an almond croissant and coffee at Pistacia Vera. 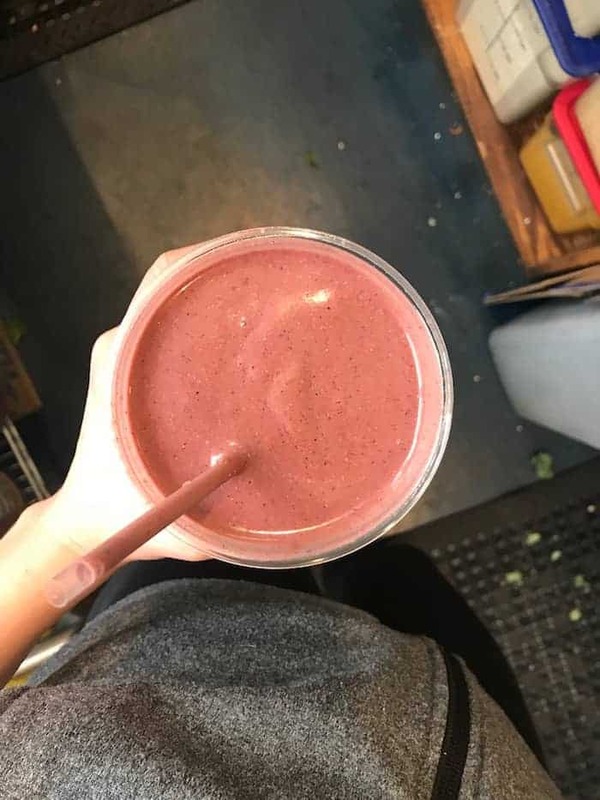 I’ve been slurping down loaded smoothies for lunch on the go when I don’t have time to take a real break. Gotta do what you gotta do, sometimes. This one was pineapple, banana, spinach, peanut butter, hemp seeds, ginger, vanilla protein, and almond milk. 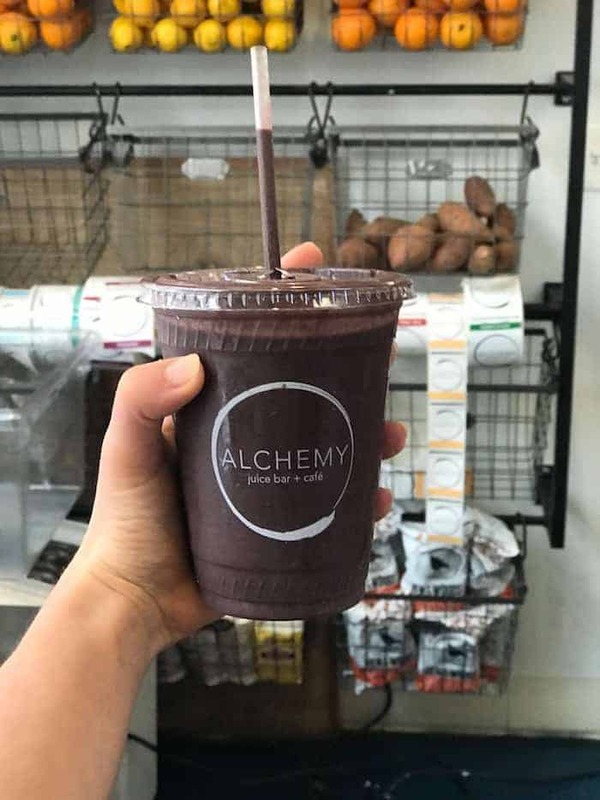 And one with was dragon fruit, cherries, banana, cashew butter, chocolate protein, spirulina, kale, and almond milk. 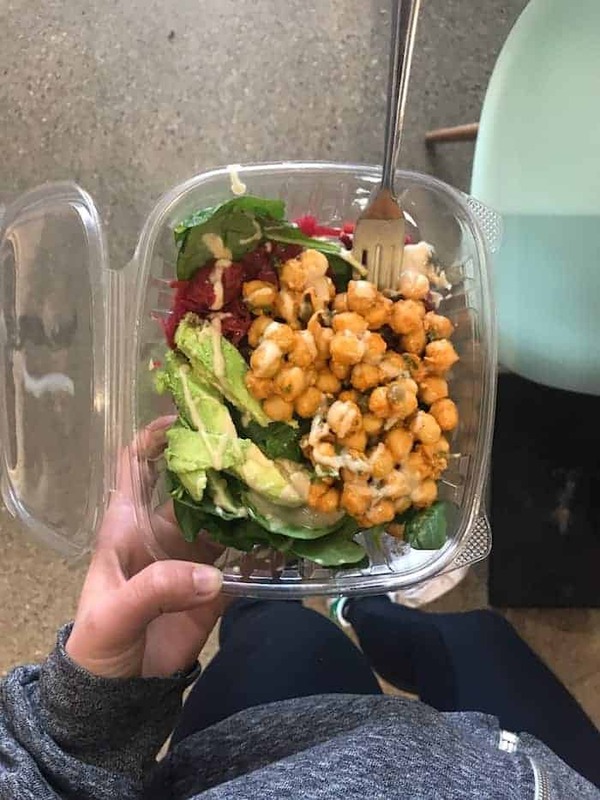 Salads in a jar on repeat! 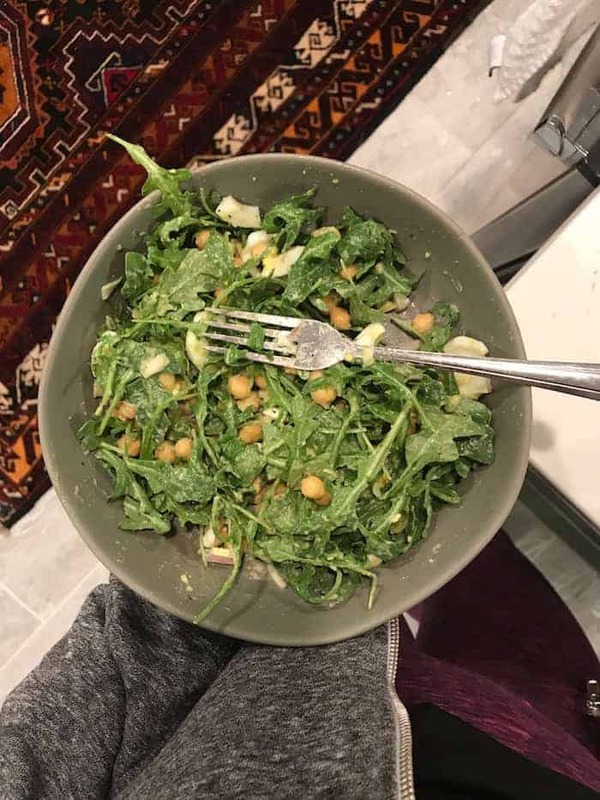 I’ll be posting the details next week but this one had avocado, chickpeas, shallot, arugula, and hard-boiled egg with olive oil and red wine vinegar dressing. 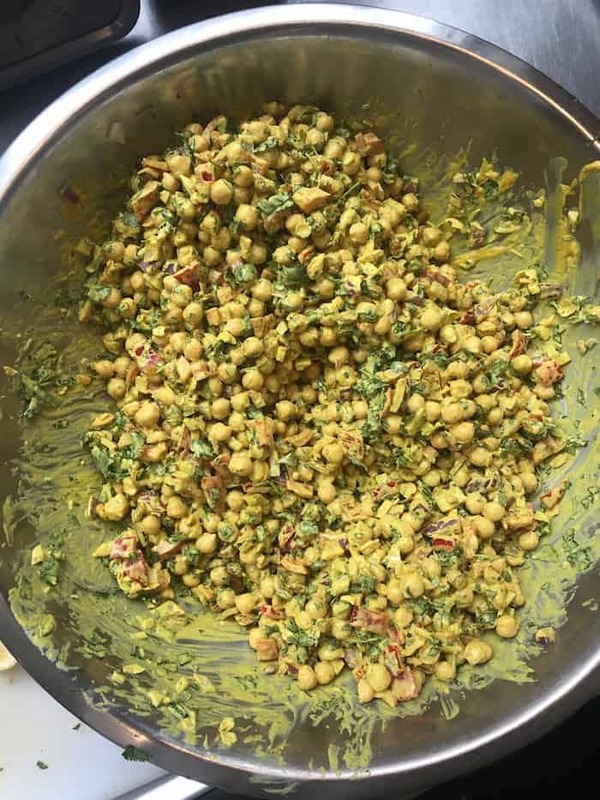 Curried Chickpea Salad after I made a big batch for Alchemy. 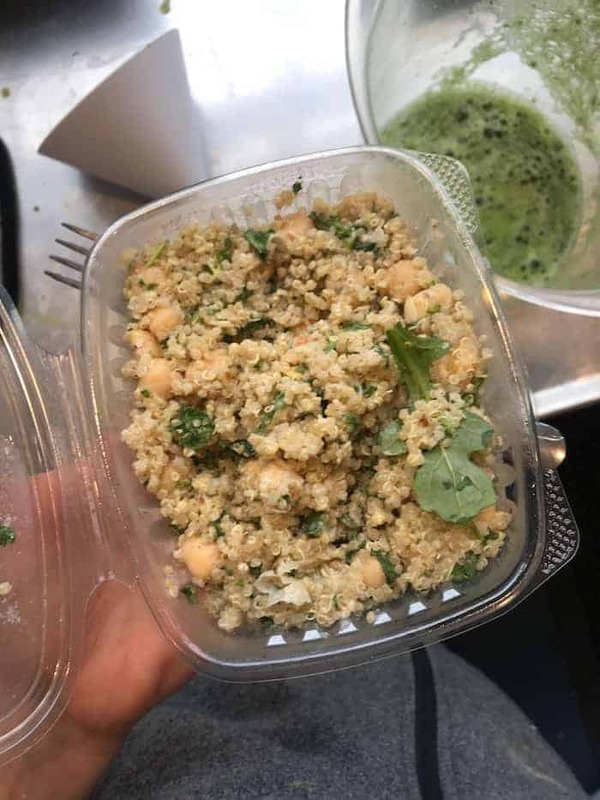 A yummy salad I made for Alchemy’s side dish with quinoa, chickpeas, tahini lemon dressing, parsley, and arugula. 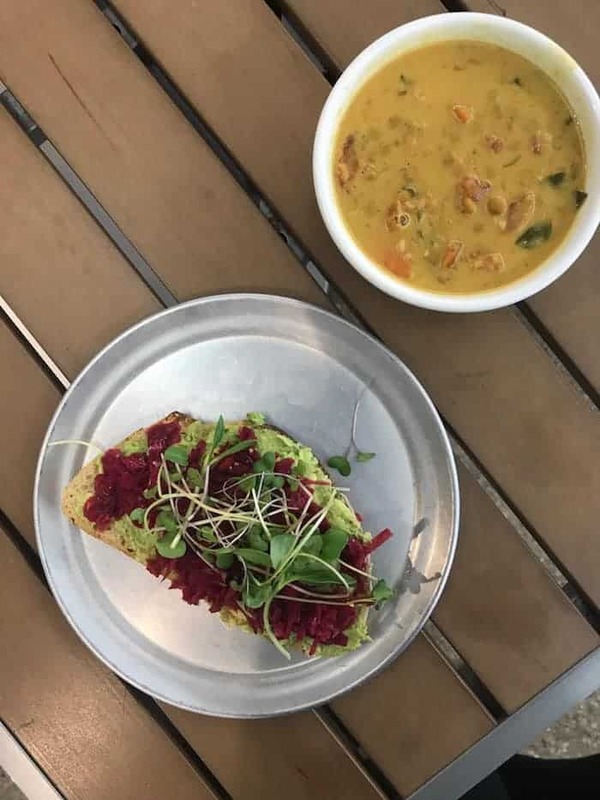 Golden Lentil Soup with avocado/beet kraut/micro greens toast. Another chickpea salad with red onion, capers, parsley, and an amazing sun dried tomato vinaigrette I whipped up with apple cider vinegar, nooch, olive oil, dijon, salt, and pepper. Gotta write that one down! I ate it with spinach, beet kraut, avocado, and more tahini. We’ve been doing TONS of pasta for quick meals. Lately I’ve been liking Trader Joe’s brown rice quinoa fusili pasta. I’ve been making big batches of arugula pesto and enjoying the pasta with sautéed mushrooms and greens from our CSA box. Leftover Slow Cooker Chili with cornbread plus a bunch of roasted sweet potatoes. Heart shaped pizza for Valentine’s Day from Harvest! Pesto for me and pepperoni for him. Leftover pizza + more pizza made from sourdough along with romaine caesar salad (tahini, lemon juice, nooch, garlic, dijon, water, salt, and pepper). Yummy vegetable and potato dumplings from Momo Ghar. 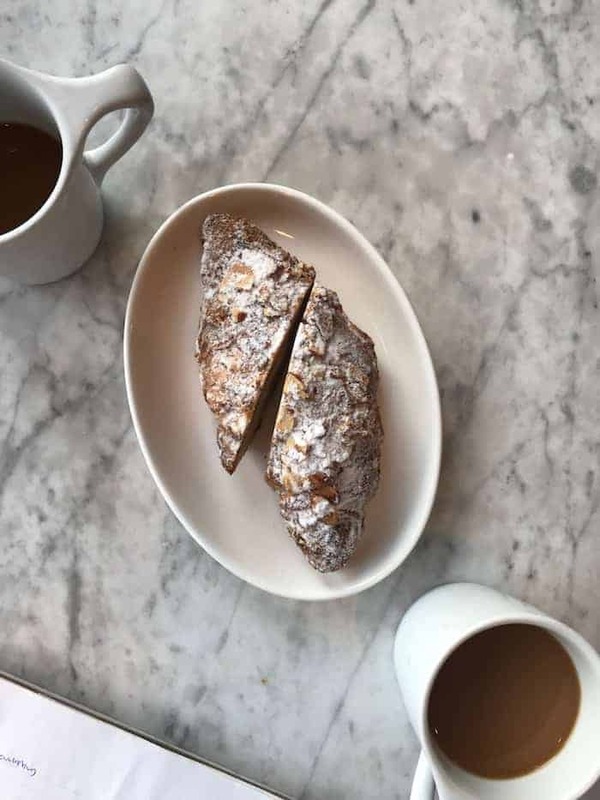 A strawberry banana superfood donut with pecans from TRISM. So much leftover Chocolate Chunk Banana Bread! The yummiest blueberry muffin and coffee from Stauf’s. Afternoon toast with peanut butter, banana, coconut bacon, and smoked sea salt. Peanut M&M’s straight from the freezer! So good. So random but I’ve been really digging coconut La Croix. I also snacked on apples + crackers and hummus this week that went un-photographed. Can’t catch ’em all! Have a delightful Wednesday, pals. 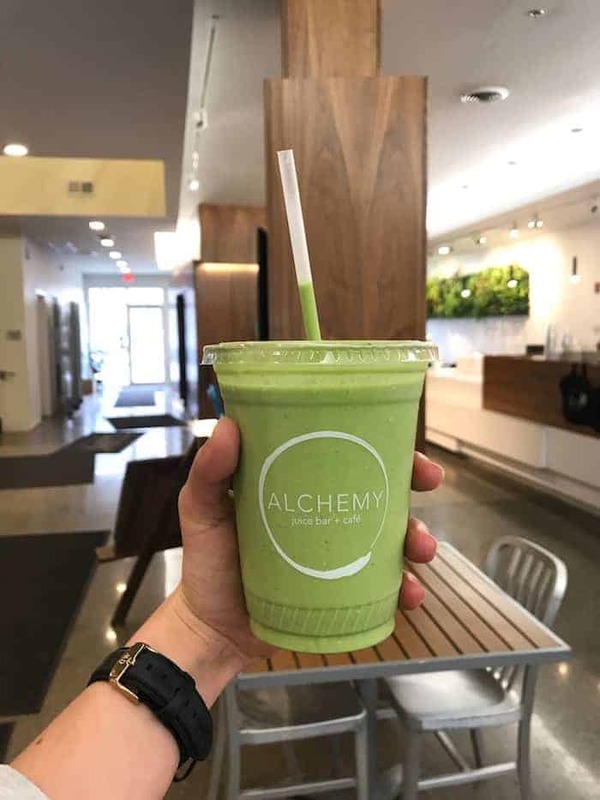 That green smoothie is on point! Coconut bacon?!! Whaz dat??? Must try. Do you have a recipe for your arugula pesto? That sounds delish! 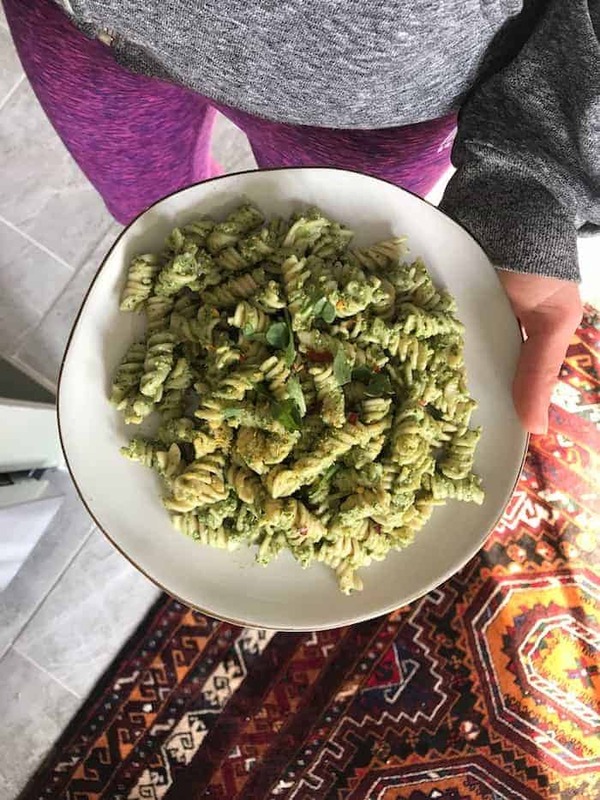 I feel like adding something like pesto into pasta makes it a much more filling and balanced meal while still being super quick and easy, so I would LURVE to see some more of your fave easy pasta meal ideas! reading these posts always makes me so hungry!!! i haven’t had sourdough bread in ages and now i’m craving a piece of sourdough toasts so hard. also how cute is your heart-shaped pizza?! this reminds me, i need a homemade pizza night. those are my fave! ooh, I never thought of that! I must look next time I’m at the grocery store. OMGGGG everything looked so amazing!!! I need to get on the making my own pesto bandwagon….that looks so delicious! I want to try those curried chickpeas and the pesto pasta…but does it get much better than peanut M&M’s?! I don’t think so :) Thanks for sharing, I always flip through these posts for inspiration of what to make for the week! Right?! I need some in the freezer at all times. 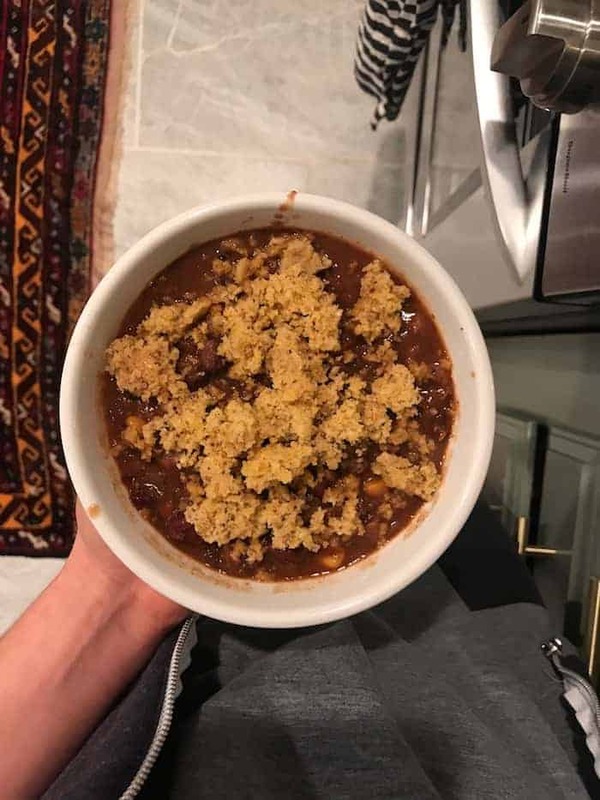 I love these weekly posts and using them for meal inspo. This cake is delicious, I like this dish.